In 2000, Maricopa County voters passed a ballot initiative by a margin of 51% to 49%, providing funding for a new Cardinals stadium as well as for improvements to Major League Baseball spring training facilities in the greater Phoenix region; and youth recreation. After some legal obstacles, the Cardinals began construction of their new facility in April 2003, in Glendale, one of the western suburbs of Phoenix. 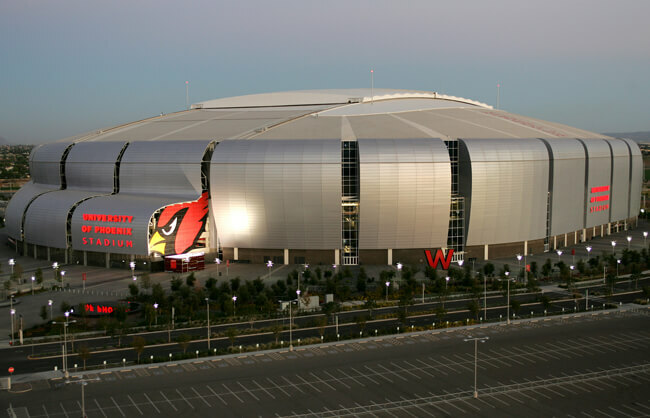 University of Phoenix Stadium features a retractable roof and a slide-out grass surface, which is good for the hot desert weather; the new stadium has a state-of-the-art air conditioning system and high-back seats. The 63,500-seat stadium (expandable to 72,800) opened on August 12, 2006 when the Cardinals defeated the Pittsburgh Steelers, 21-13, in a preseason game. The Cardinals then hosted their first regular season opening day game since moving to the Phoenix area in 1988, defeating the San Francisco 49ers in a rematch of the 2005 blowout in Mexico City, 34-27, in front of a sellout crowd of 63,407. In February 2008, the stadium hosted Super Bowl XLII.